File Replicator is a program that searches for a specified file within a specified root folder and replaces it with another copy of the file. This is useful for updating a file that is located in multiple folders to a newer version. This is a GUI based replacement for the File Propagator script. 02/14/10: v1.2.1 has been released. Release notes below. 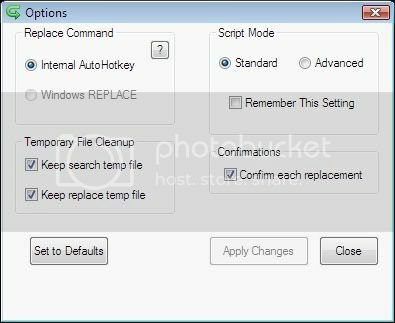 -Engine upgraded to AutoHotkey v1.0.48.05. -Added Windows 7 to the supported and tested OS lists. -Removed Windows Vista from the tested OS list because I no longer have any PCs running Windows Vista to test on. The OS will remain on the supported list. -Includes v2 Revision 2.1.0 of the File Replicator Manual. -Installer upgraded to Script Setup Utility v2.6.1. -Made several changes to how version information is interpreted and displayed. Please Note: Upgrades from v1.0.0 or older are not supported due to the changes made to the installer. You must uninstall that version before installing the latest one. None at this time, but I am open to suggestions. I have attached two downloads to this post. FileReplicator_setup.exe is the version with an installer based on Inno Setup, FileReplicator.zip is a zip file with no installer. If you use the installer it will create shortcuts where you specify. If you use the zip file extract the contents to a folder and run the .exe. The script is pretty straight forward, but I have created a manual (included with the download) that will guide you through all of the various options offered in the script. If you use the installer you can uninstall it from Add/Remove Programs (Programs and Features) or from the Start Menu (if you had the installer create Start Menu shortcuts). If you use the zip file just delete the extracted files and folders from your PC to uninstall. nice, i can see where this might be useful. would be nice to have an option (set by default) to show a confirmation messagebox each time it finds a file it is about to replace, so user can verify and click OK/SKIP/CANCEL. Good idea! I'll look into implementing that. I have released v1 BETA 5.0.0, which implements the replacement confirmation dialogs as mouser suggested, and makes a couple other changes. I would appreciate it if anyone who tests this release could let me know if they find any bugs or issues. The NANY 2009 release of File Replicator is now available. Enjoy! Is it possible to replicate the file from a URL? That would be awesome. That's a great suggestion. I'll put it on my To Do List. I would probably have to download the file to the replicating PC first then go from there, as I believe the commands I use in AutoHotkey to copy the file don't support URLs. It may be a while before I can implement this, but I'll let you know when I do. That sounds like a great idea for another app (I'll make a note of it) but is probably out of scope for this one. For those searching this program: The filereplicator website seems to have gone offline (July 2018) - I could find a download link for the installer on a third party website. which would make it portable.